When working with ASP.NET Webforms the ability to quickly generate working forms that are bound to your datasource can be a huge advantage. Earlier I was creating a Webform in Visual Studio 2010, and as part of the process I dragged a SQLDataSource object onto my page, hooked it up to a stored procedure I had written, and then dragged a FormView control onto the page and associated the FormView with my SQLDataSource. The great thing is that I was able to simply click an option on my Form Designer control that populated the entire form for me. In Visual Studio it’s just that simple! I then just had to add my own styling for the page and convert some of my fields to editable textboxes and dropdown lists. In general this is incredibly fast and simple and allows you to add content to the Web quickly. I will go step by step through setting up a simple ASP.NET WebForms site and populating a form from a datasource (in this case a MS SQL Server Stored Procedure) without writing a single line of code. In the window that opens select your language of choice (I used Visual Basic), then select .NET Framework 4 & ASP.NET Web Site. Under the file system don’t forget to give your new site a name (I called mine GeneralTesting). Once you click ‘OK’, your new site will be created. 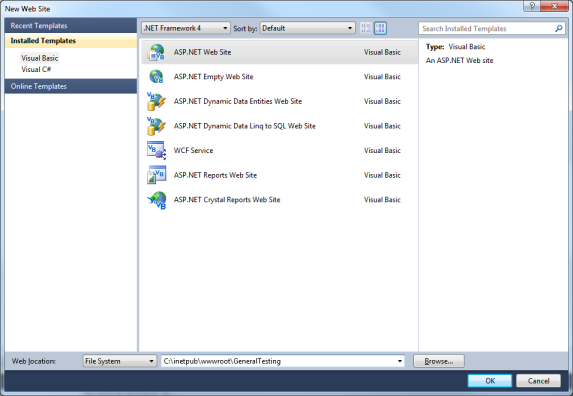 Click on the Default.aspx page so that it appears in your Visual Studio Design view. 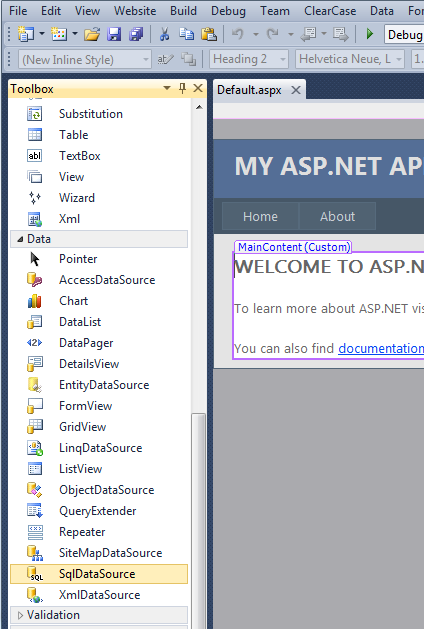 Now to add your datasource to the page, open the toolbox on the right hand side of your Visual Studio Design View. Double click the SQLDataSource to add it to your page, or you can also drag and drop it. Once it is on your page, you will see the option to configure your data source. You can do so through a Wizard like interface that will take you through the steps of hooking up the SQLDataSource to a Stored Procedure or direct SQL Query. Basically just enter the name of the server and the name of your stored procedure. When you have completed hooking up the SQLDataSource on your page to your database, browse back to the toolbox on the right hand side of your Visual Studio Design View. Once the FormView is on your page use the Choose DataSource select list to choose the SQLDataSource that you previously added to your page. At this point your Form is hooked up to your SQLDataSource! Congratulations! A final step is still needed though. Although the FormView is connected to your SQLDataSource, right now your FormView will not show anything if you choose to run the WebForm. Now comes the final step… you can ask Visual Studio to automatically populate your form with data from your SQLDataSource. First set the Default view for the form. There are three states that the FormView will be populated with; these being Edit, Insert, and Read-Only. Visual Studio will populate all three states with read-only label controls regardless of which you pick as your default view. In this example I will set it to the read-only setting. In the right hand properties pane look for the DefaultMode option under the Behavior heading. Now that the default view state of the FormView has been set, we can ask Visual Studio to populate our new form. Note that the FormView control has three primary States that will be auto-populated for you. These are: InsertItemTemplate, EditItemTemplate, & ItemTemplate. Click on your FormView Control. Then Click on the FormView Tasks tab that appears at the top right of your control. Voila! Once you have finished with the Refresh Schema wizard, Visual Studio will populate your form for you. 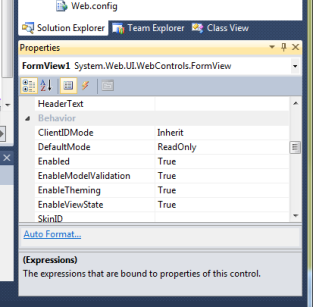 Auto-populating a Web page using the FormView control is definitely a useful feature of Visual Studio. I use it often when I need to quickly create a new form for users to access. I hope this getting started tutorial has been useful! Nice information and thanx for all printscreen !! Webform are really usefull and development is also fast in it .. Thanks Vishal, I’m glad you liked the article! I really like the speed and simplicity of WebForms… it’s such a useful technology when development speed is important. This is such a quick trick I can see myself using when putting together a prototype in a hurry. Hi Luvy, yes this is definitely a useful technique, I’m glad you found this post useful! I like using WebForms a lot and the more I play with WebForms the more I like the speed of developing with them!